What is a Solar Panel Battery? Solar Panel Battery is the name sometimes used to describe and home energy storage system that captures and stores renewable energy generated by a solar pv installation. The solar panel battery allows you to use the stored excess energy at times when there is no pv generated from the system and maximizing the self consumption – basically filling in the blanks. More energy hits the earth In 1 hour than we use in a whole year! We can all make a big difference to global warming! By switching to solar renewable energy and a battery storage system you can reduce the need for buying energy produced by the grid by burning fossil fuels, we only have 1 planet and its up to us to look after it. 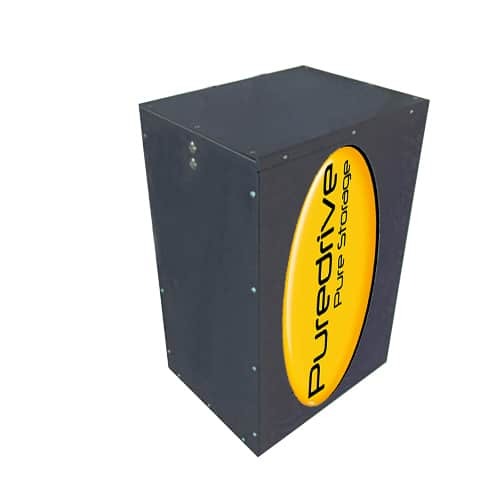 Pure Storage is the ideal solar battery solution for maximising and improving the use of self-generated power at home. Pure Storage solar batteries store spare solar energy, to enable you to use energy when you want to. helping you to manage your energy needs. Using a 4.8Kwh LiFePo4 solar battery. This allows you to increase your utilisation of generated power from 30% to around 80% powering your home from the battery during the evening and through the night until the sun rises. Future proof your energy costs!